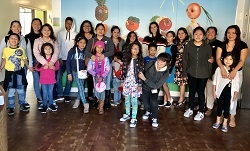 Our 1st newsletter of 2019 is dedicated to our friends and partners-old and new-that made the 2018 holiday season especially bright for Hope Street Margolis Family Center children and families. The holiday season started off with a wonderful early Thanksgiving lunch provided to over 350 Hope Street children and parents by Nashuva, a spiritual community. Families also received food baskets and holiday gifts. 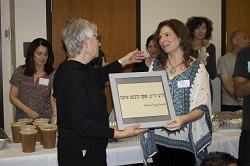 Hope Street Director, Vickie Kropenske, presented Rabbi Naomi Levy with a plaque that read "We were strangers and you welcomed us" to thank Nashuva volunteers for preparing and serving the Thanksgiving feast for 14 years. Want to learn more about Hope Street? Schedule a tour today! On Thanksgiving Day, AEG hosted their annual Community Thanksgiving Celebration at NOVO at L.A. LIVE and invited 300 Hope Street children and parents to enjoy a traditional holiday meal prepared by Wolfgang Puck Bar & Grill. 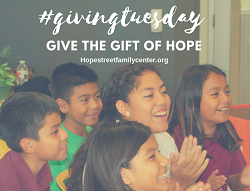 Thank you to everyone who supported Hope Street on Giving Tuesday, an annual global day of giving held on the Tuesday after Thanksgiving. Donors contributed to our education, health, and recreation programs. RSVP for the Champions for Children Luncheon today! 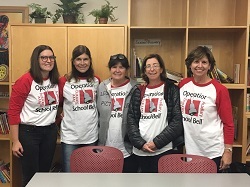 After taking measurements and checking them twice, volunteers from Operation School Bell, a program of the Assistance League of Los Angeles, provided new school clothes, shoes, and backpacks for 40 children at Hope Street. A longtime supporter, Downtown law firm, Dentons, returned this year to adopt families from our Family Literacy Program for the holidays. Parents hosted a delicious thank you potluck luncheon held on the basketball court of Hope Street Margolis Family Center. 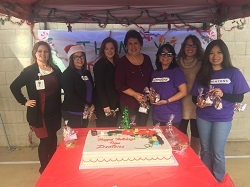 Representatives from Wells Fargo visited Hope Street to donate over 200 Wells Fargo stagecoach plush ponies to children enrolled in our three Early Childhood Centers. 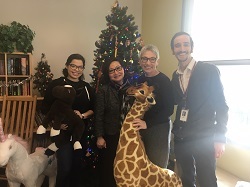 Wells Fargo History Museum curator, Trent Sneed, also stopped by the Margolis Child Development Center's Holiday Party to meet our families and distribute the ponies to the children. 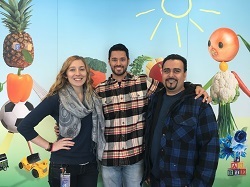 Staff from NBCUniversal stopped by Hope Street Margolis Family Center to deliver toys for our Early Childhood Center and take a tour of our classrooms and facility. Mane Addicts hosted Baby2Baby's holiday event at a Westside salon for 50 Hope Street parents and their children. Each participant received a haircut, styling, and gift bag to take home.